I had a friend whose father had a quirk. When he bought a new car, he would drive it home and immediately use his key to put a nice big scratch in the paint. His rationale was that you tend to drive a new car overcautiously for fear of marring the shiny new toy, and he didn't want to go through that unsafe phase. He just got the first scratch out of the way as quickly as possible so he could move on. In a concert, I sometimes have that same overcautious feeling at the beginning. Before I make a mistake, it is possible that I might have a perfect performance. Maybe this will be the night in which I am awesome in every entrance from the start to the finish! Of course, that is not really possible - there's always something I could do better - and it's also not a particularly productive way to think. It makes me play tentatively and boringly. Generally, once I get that first mistake out of the way I can relax and move on. I can open up and take some risks, and ultimately give myself the opportunity to make greater music. Of course I am not talking about big mistakes, or audible ones, I hope. A little chip in an awkward slur, a slightly late attack, an overabrupt release, a note approached too sharp and quickly corrected. In the scheme of things these are not going to ruin the listener's experience, but I am always working for the best possible delivery of each note, phrase, movement, and work. 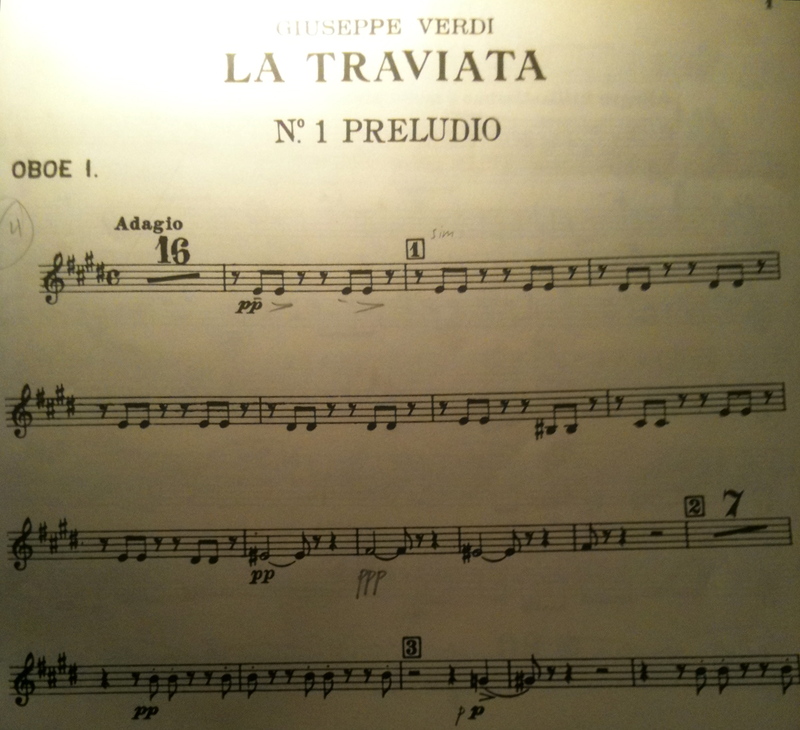 La Traviata is perfect for me. The opening page is this. It looks so easy but there is nothing harder on the oboe than repeated soft low notes that need to be perfectly shaped and blended with the rest of the winds. 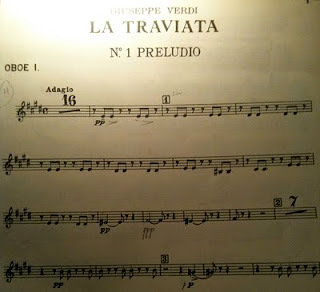 While I do have the savvy to stay under the radar here - I won't crack and blat any of these in a way that the audience can hear - I doubt that I will play this page PERFECTLY even once during this run. Always there will be one that doesn't quite speak, or one in which my note length does not match that of my colleagues. It is a challenge I look forward to - that of beautifully placing every one of those low E's - and if I accomplish it I'll be sure to let you know. However, I suspect that by page two of this work I'll have that first little mistake out of the way and be ready to enjoy myself for the next two and a half hours.